Can someone confirm if it’s legal or illegal to have the front number plate displaying in the front windscreen ? Spaceman_RS3 and Rob2k68 like this. As above - can’t remember what it is off hand but there’s a max height limit from the ground. Read the state law. Some do not require front plate. But states that have front plate as requirement typically say the plate has to be mounted on the bumper perpendicular to the road. Going by the OPs previous posts he is based in the UK where it is law to have a front number plate. Illegal at least in the UK . Guy who have removed their front plates in the UK (which we know is illegal and dodgy) have you found any drilling of the existing plate into the grill? I assume that the RS3 plate holder comes separate to the car and not fixed on the grill. However my suspicion is the dealers on PDI would just drill through it and make a hole in the grill behind depending on the care and/or knowledge of the persons putting on the plates. And based on the number of plates that are not on straight I think that if I removed my plate I would probably find a couple of holes. In which case surely the dealer should replace the grill? As they damaged it. The holder is screwed into the grill with 4 screws, into purpose built holes and can’t be avoided. The issue comes when dealers drill the plates through the front backing plate into the honeycomb. I beat the dealer to it and asked them to remove the backing plate before any screws went in for a plate, it’s a case of removing the 4 screws and bravely pulling the clips out of the honeycomb. The backing plate comes from factory like that, as I said unavoidable but the holes aren’t that noticeable more so the solid 4 parts of the honeycomb grill. Have a look at plateless ones and you will see what I mean. Now I have a very small cut down old plate which lines up with the original 4 fixing holes, screwed to the grill and then a short plate Velcro’d onto the small backer so I have no surround on the small front plate. But surely they could have drilled the holes through into the grill anyway. The only way to know would be to remove the plate totally. Yes they could have but don’t go looking for problems if you are leaving the holder on the front. I had a grill replaced under warranty on my A3, led to a cracked bumper.. from your post it seems like you are looking for a reason to complain. Technically the backing plate needs to stay on, it’s not Audi’s fault they are doing what they have to in order to fix a plate and it’s pot luck whether they hit the honeycomb or not. Yes it looks great doesn’t it? The idea came from somebody else on here. Before I had the car I cut a plate holder down to use the back of it but it was too flimsy and Velcro too strong, never thought of an old plate... works so well! Same as AudiNutta, I asked the dealer not to screw on plate and just remove the plate holder while doing PDI. Then removed the black backing trim also. sve170, FBF01, RS4B5 and 2 others like this. Did you remove your front bar protection beam? If so how? Illegal, and it also make you look like a try-hard bell-end too IMO. When you get to the point of arguing "why aren't you cops out catching real criminals".. this is why. Wankers wasting police time for nothing but idiotic vanity. Lol, are you a Panama fan? q5man, AB RS3, billymc92 and 2 others like this. You have to remove the bumper to reach the black trim behind where the plate sits in front of. Does this have any negative impacts? Less protection for the already vulnerable intercooler on these. I’d like it gone, but it’s increasing the unprotected areas of the radiator. @billymc92 have you had any issues with damage mate? Haven’t heard of any, only takes one stray stone doesn’t it. Just seems like tempting fate a little? Is it possible to get legal side mount reg plates for the RS ? You know who sells them ? RS4B5 and AB RS3 like this. Ha ha, what an idiot. But at least those people doing 33 in a 30 would (if it was set to that limit) would get their registration picked up by a front facing speed camera, which is the point. Also means that the car can't be picked up on police camera cars that check for tax and insurance (I'm sure you'd be as peeved as anyone else if you ended up being hit by an uninsured driver who'd managed to get away with it because he'd not got a front plate on) etc, etc. It does make me laugh that some people think that any little law they deem doesn't apply to them has no consequences further than the actual offence. DW81 and T-800 like this. What I don’t understand is why people actually want to do this in the first place. It looks tacky. There must be a lot of surplus money sloshing around the UK..? This is quite an interesting topic, as it depends on a few different things. 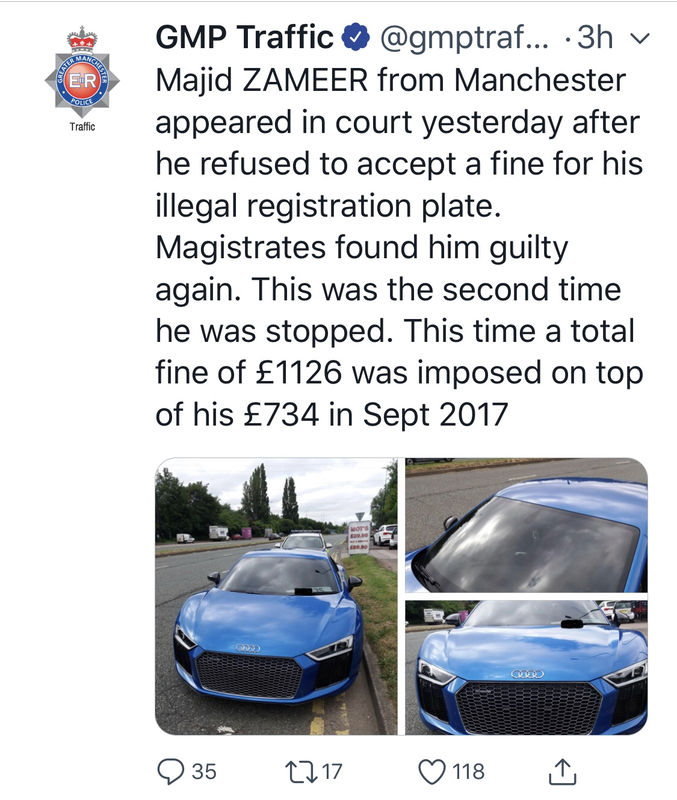 It is totally illegal to not display a front plate and have it on your dashboard, however if you're driving around in a Murcielago the police are quite unlikely to stop you for not having a front plate, unless you're already driving like a bellend, in which case the penalty will likely be added on. This goes for most of the UK, although some places like parts of Manc, Leeds, Bolton you might not be able to get away with it. There are plenty of supercar owners in the Home Counties area who never run front plates. On the subject of side plates, largely illegal on the RS3 as you would have to run a smaller front plate than legally allowed. Side plates are only allowed on cars that are like that from factory like Alfa Romeos or Evos. 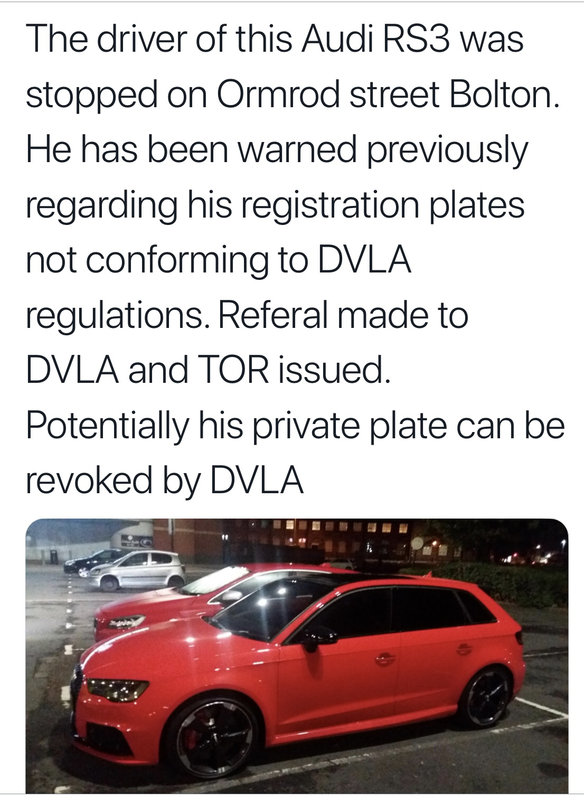 However, if you have a short personalised plate, you are allowed to run smaller plates that are totally within the confines of the law- the smallest plate you're allowed to run is 291mm x 105mm, which would be all plates 4 digits and under. Above that it's a sliding scale of minimum size allowed. At the same time, there are again plenty of supercar owners who run extremely small front plates and don't get pulled over. AudiNutta and teslaboy like this. That means if I want to look like a **** with no front plate I need to buy a supercar.